Cabernet Sauvignon Shiraz by Lake Breeze of Langhorne Creek. It's lifted aromas carry a heady whiff of exotic spice, leading on to a juicy palate underpinned by smooth, smoky vanilla/ coconut oak and firm, pliant tannins. A vineyard of some historical import, Bernoota is the original block, planted to the Follett family homestead along the banks of River Bremer, two decades before federation. The Follett family vineyard was established in the 1880s by Arthur John Follett, great, great grandfather of today's winemaker. This is an impressive wine with persistent dark berry characters and genial acids, seamlessly adjoined into a full bodied, complex wine of great poise and solid structure. The Follett family vineyard was established in the 1880's by Arthur John Follett, the great, great grandfather of Greg Follett, the winemaker. The varieties grown on the vineyard include Cabernet Sauvignon, Shiraz and Chardonnay, with small blocks of Grenache, Merlot, Petit Verdot and White Frontignac. 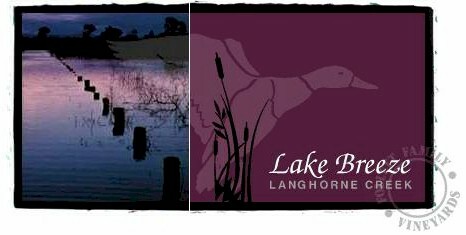 Lake Breeze winery lies on the banks of the Bremer River and is surrounded by majestic river red gums and overlooks the 80 hectare (200 acre) Follett Family Vineyard. The vineyards are managed by Greg's brothers, Roger and Tim, whom he relies on to provide him with consistently outstanding fruit. The varieties grown on the vineyard include Cabernet Sauvignon, Shiraz and Chardonnay, with smaller amounts of Grenache, Merlot, Petit Verdot and Malbec. 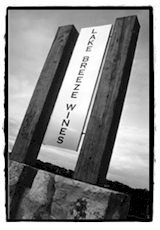 Lake Breeze selects only the best 25% of fruit from the older vines for its wines, resulting in a limited crush of only 200 tonne. The majority of the fruit used is carefully selected from old vines - between 30 & 35 years old, with the oldest vines being our 70 year old Grenache. Langhorne Creek is renown for its full bodied red wines, the grapes have an intense quality due to the location and unique natural influences. Cool afternoon breezes from Lake Alexandrina help to create a surprisingly cool climate, which allows for a longer, more even ripening period. This is coupled with deep, rich alluvial soil, which is deposited by the unique annual flooding of the Bremer River. The old vines, which are dry grown, rely on winter flooding of the Bremer River, which emanates from rainfall in the Mount Lofty Ranges between Mount Barker and Callington. The flooding is vital to carry the vines through the dry summer months as Langhorne Creek only receives on average 14" of rain. Flooding is carried out by utilising the winter flow of the Bremer River, through a system of floodgates and banks, which divert water onto the vineyards. From here it remains for one or two days, until the soil is saturated and is then released onto the neighbouring vineyard. The well drained soils receive a deposition of silt during the annual floods, which ensures that the fertility remains at a high level. The 'alluvial silty loam soils' allow for excellent water holding capacity, therefore making full use of the winter floods, allowing the vine to carry through the summer months without supplementary water.